In what is beginning to feel like some of our unhappiest childhood memories, we are sad to report that our once-stalwart urban designist, Jacob Allderdice, has again lent his talents to the competition. Who needs the ol’ blob, apparently is his thinking. He apparently has bigger fish to fry. We’d like to say to hell with him, and “let it go,” as the euphemism has it [“Allderdice, you’re fired!” is what we’d mean–ed.] but without him, um, we’re nothing. And we’re not just whistlin’ dixie here. Allderdice’s latest screed has him shouting at Paula Fletcher, councillor for Toronto Ward 30, regarding her misguided attempts to “help” bicyclists by putting a bike lane on a busy arterial road where cyclists have no desire to be. She’s taken Eastern Avenue, a scary four-lane road that takes rush hour car commuters (1,685 of them per hour, peak period) and throws them into downtown Toronto. Out of Eastern, she’s chopped an eleven-block section (from Leslie St. to Logan) where she proposes an experiment: namely, if you build it, will they come? See, at present no one rides a bike on Eastern Ave. Why? Because there are other, more pleasant and more useful roads to take on a bicycle. 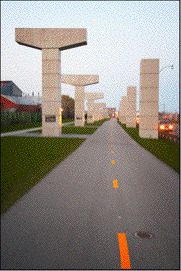 You can ride on the gold-plated Lakeshore bikepath. You can ride on Queen, with its streetcar-becalmed traffic, its shops, restaurants and apartments. You can take the bikelanes on Dundas East if you’re in a hurry to get downtown on your bike–it’s about a two minute bikeride north of Eastern. These other east-west biking options differ from Eastern (and from Fletcher’s proposal on Eastern) in that they actually take you where you want to go. Dundas gets you to River, River to Shuter, and hey-presto! You’re downtown. Lakeshore takes you to a new bridge over the Don River, built just for bicycles, and from there hooks you up to the Martin Goodman–you can practically ride all the way to the offices of the Toronto Star and Car Advertiser (at 1 Yonge St.) on segregated bikepaths. Queen has workplaces, residences, and–did we mention? Places to eat dessert. Eastern Avenue has none of this. Instead, it concludes its westward, downtown-veering stretch with a lane-weaving pretzel of an intersection with the car-jacked Don Valley “Parkway.” Does Eastern have cafes, restaurants or pleasant vistas that cyclists would be drawn to? No. Does it have a Hell’s Angel’s Motorcycle club, a lot of warehouses and empty lots, and a failing film industry? Yes. Do people who live on Eastern ride bikes? Yes, to get away from Eastern. Is Eastern on Toronto’s bikelane masterplan? No. Why is Fletcher looking at Eastern? We don’t know, but we have our suspicions. First of all, what she says is that about two years ago, residents in streets off Eastern came to her with concerns about the fast traffic. Can you blame them? If you lived near an airport, wouldn’t you be pissed off about the roar of the jets? If you had kids and Eastern in your back yard, wouldn’t you be thinking about moving? Why should you have to move? It’s cars from Scarborough and the Beaches making your life dangerous. It’s trucks and taxis avoiding congestion on Queen and Lakeshore boulevard. It’s motorcyclists from all over the city who’ve found a place to make their own personal hell. Secondly, there’s Walmart. What’s up with that? First Pro development corp. has bought control of the land formerly known as Toronto Film Studio on Eastern Avenue. Whozat? First Pro? Just the development company behind every Walmart store in Canada. Fletcher puts up a brave front, saying Walmart is not going to be allowed to come to Ward 30 under her watch, but we think her hands are tied. See, there’s the little matter of something called “zoning.” The land south of Eastern is zoned “employment lands.” This means Toronto Film Studio was not allowed by the city to build the “mixed use” residential/commercial project they proposed last year, one that included numerous new small streets linking south from Eastern to Lakeshore. Then there’s the big-box Loblaw grocery store at Leslie and Eastern, and the big-box Pricechopper grocery store at Leslie and Lakeshore, and the big-box Canadian Tire department store ready for a grand opening this spring at the same intersection. When (and that’s the operative word) Firstpro takes its Walmart proposal to the OMB what will happen? What’s one more big box in a field of big box stores–and, arguably, Walmart means “employment” (even if Fletcher’s husband John Cartwright, head of Toronto and York Region Labour Council, might be more inclined to see it as wage slavery). No, Walmart is a given on Eastern. The best Fletcher can hope for is to remake the street into a “friendly, slow, residential neighbourhoood” that tells Walmart: “Unload your trucks and your mega parking lot from some other direction.” This, we suspect, is at least part of Fletcher’s desire for bikelanes here. And who knows? It might just deflect Firstpro completely. It’s nothing but traffic calming. It’s not a concern for cyclists’ needs. There’s been no consultation with the cycling community that indicated cyclists would like bikelanes here, as opposed to somewhere else, in fact at the two public meetings Fletcher called prior to announcing this proposal (neither meeting at which she herself appeared), cyclists were adamant that the problem is Leslie St., not Eastern. Fletcher sent lackies [shurely you mean “administrative assistants” –ed.] to both these meetings, and from both meetings the lackies went away with clear instructions to Fletcher: forget Eastern. It’s Leslie that needs work. So what is it about Leslie Street? First of all, there’s the spit. Leslie Street spit that is. A glorious carfree paradise that’s centrepiece to the new Lake Ontario Park that was just announced a few weeks ago, designed by celebrated New York architects Field Operations (FO) [Same to you–ed.]. The new park has two major axes. One is east-west, from the Port to the Beaches. The other is north-south, tying the Leslie Street Spit back to the city. The critical node in the FO plan for Lake Ontario Park is thus where Leslie Street hits Lakeshore boulevard. The fact that this critical gateway has no infrastructure for the intended users of the park: cyclists and pedestrians–to enter safely from residential areas to the North is a sign of outright failure on the part of the designers and the organization planning the park. Then there’s the stretch of Leslie between the new park and the residential neighbourhoods to the north. This stretch is dangerous. For one thing, it is four lanes wide but its peak loads (760 cars per hour a.m. peak, 615 cars per hour p.m. peak) are just two-lanes-worth of cars. That means drivers will perceive the road as emptier, and rush to fill “gaps.” For another thing, it has driveways to the parking lots that think they’re roads: The city has even put traffic lights to control traffic entering and leaving the parking lots. So even though the sidewalk marches across the driveway, you’ve got to have these little reminder signs shrieking “Pedestrians, obey your signals!” (and woe betide you if you think it’s unnecessary). This stretch of Leslie is so unpleasant that a whole row of about 20 1970’s-era townhouses “backlots” against the street on the west side. Whoa! Is this the suburbs or what? The street is a mess. It’s also where Isaac Morkel was killed, December 20 2005, riding his bike to Loblaws for some groceries. An experienced cyclist, he was hit by an 18-wheeler whose driver was allegedly “lost.” Morkel had a green light. Children and elderly, walk this street at your peril. Experienced cyclists, maybe you should consider dismounting. Yet it’s these folks: children and elderly, experienced cyclists and not, that might be expected to make use of the new park. It’s these folks who could conceiveably walk or bike to the big-box grocery stores for food or work. It’s Leslie that has to be fixed. Eastern is another matter. But by putting a bikelane on Eastern, a street that carries a peak load of 1,685 cars per hour, we have to remove a lane of traffic. Now one lane is being asked to carry roughly double what any single lane can be expected to carry. There are 800 cars an hour now that are going to be looking for somewhere to turn off. They will take Leslie. Leslie, as we have demonstrated, has capacity for all those additional 800 cars per hour. This entry was posted on Friday, March 9th, 2007 at 1:22 pm	and is filed under A Question of Urban Design. You can follow any responses to this entry through the RSS 2.0 feed. You can leave a response, or trackback from your own site. Rd west until Warden, why not all the way downtown via Eastern." Once again, Allderdice is spreading himself thin. Now it's NOW. We are going to have to reign him in. Can bike lanes save the east end from mega-store takeover? Could it be that the creeping shadow of a big-box invasion is fuelling the current dust-up over an eastend bike lane? The question comes easily to mind watching cycling promoters try to finesse a new route on Leslie from Queen south to the Spit – a stretch they identify as a missing link in the city's east-end cycling network. At a meeting at Bruce Jr. Public School on March 7, just over a year after a truck killed Isaac Morkel as he rode through a green light at Eastern and Leslie, bike lanes fill the agenda. "If you stand at the corner of Leslie and Eastern, trucks are whizzing by all the time and women are walking by with baby carriages," says Morkel's brother Peter, highlighting the oddness of an area that is supposed to be residential but exhibits all the traffic chaos of the industrial zones of the port lands to the south. The proposal on the table is not for a lane on Leslie, but for one on Eastern, which biking activists consider far less important. That's a problem for local councillor Paula Fletcher, a pro-bike politico who finds herself caught in a tussle between residents and nearby fast food chains eager to preserve drive-thrus. The issue has also touched off a kerfuffle with Fletcher's NDP ally in the neighbouring ward, Beaches-East York councillor Sandra Bussin. Ever since a section of the Gardiner east of the DVP came down in 1999, motorists have flooded Eastern. Residents complained long and hard. Fletcher's plan – an 11-block Eastern Ave bike lane from Logan to Leslie to move cyclists and act as a traffic calming device – seemed a win-win. Her mission, she admits, is to keep the area as residential as possible. But anyone riding the Sheppard subway line will tell you people don't use routes with useless connections, so unless tons of cyclists need to visit some warehouses or an empty lot that may or may not eventually be home to the scourge of big-box obesity, Eastern seems pointless as a route. Jacob Allderdice, a cycling activist, says that while it's great to see new bike lanes, the lack of one on Leslie is a travesty. "It's the node! It's the gate!" exclaims an emotional Allderdice. Fletcher agrees that Leslie may seem most logical for a bike lane, but she says city staff think the street is too narrow to accommodate it. Then there's Bussin's opposition to lanes on Leslie. "Sandra has the other half of that," Fletcher says, referring to the fact that Leslie divides their wards, "and she doesn't support it." Bussin says Leslie is too complicated, and the lights at Loblaws only make it worse. "The original plan is the wise one: having a lane on Knox. It provides that north route and it's only a block and a half east of Leslie." Bussin calls Fletcher's Eastern bike lane "industrious," but she's skeptical. "To use [bike lanes on] Eastern as a tool to stop traffic is not a good idea. It's going to create confusion, and trucks will go on Queen." Bussin suspects that Fletcher's bike lane proposal is an attempt to fend off an influx of mega-stores. Coincidentally, Toronto Film Studios on Eastern has recently sold its site to big-box developer SmartCentres. A monstrous Canadian Tire already sits on Leslie awaiting its official unveiling. "I don't think you should be using cyclists to traffic calm in an attempt to stop big-box deliveries," says Bussin. She further questions the approach of "rallying activists'', noting that the best solution is to leave the matter of box stores up to the oracle at the OMB. Ha! But David Dunn of the city's transportation services says it's "not impossible to accommodate bike lanes on Leslie.'' If it can be done on Eastern, which has more than twice the traffic and is two metres narrower, it can be done on Leslie. "But it's very busy and there's lot's of turning movements." And let's not forget the interests of the drive-thrus at Tim Hortons, Wendy's and Burger King as they fight for the convenience of their sedentary clients. "There's some resistance to this (Leslie proposal)," notes Fletcher. Eventually, the cyclists' pleas at the meeting resonate with the councillor, who promises a detailed investigation into the Leslie lane by May. I knew Isaac, well enough to call him friend. Isaac painted my house and lived with me one summer...."I'm not good at delaying gratification" he said to me once when I wondered why the job was taking a bit longer than it probably should have. Isaac was a bear of a man, a deeply caring friendly one who lived on an edge I never understood but came to appreciate, even envy. I still feel his loss and still can't believe what a stupid senseless death he suffered. Every now and then I visit the corner where my friend Isaac died, I still miss him.